[JURIST] The US Supreme Court [official website] on Saturday allowed [order, PDF] Texas [official website] to enforce a strict 2011 voter identification law [SB 14] requiring voters to show photo identification at the polls. The court provided no reasoning in its order, which will be in effect for November’s general elections. Early voting in the state begins [state voting schedule] this Monday. Justice Ruth Bader-Ginsberg, joined by Justices Sonia Sotomayor and Elena Kagan, dissented, arguing that the law provides Texas with the strictest voter ID regime in the US and will affect a disproportionate percentage of African-American and Hispanic voters. 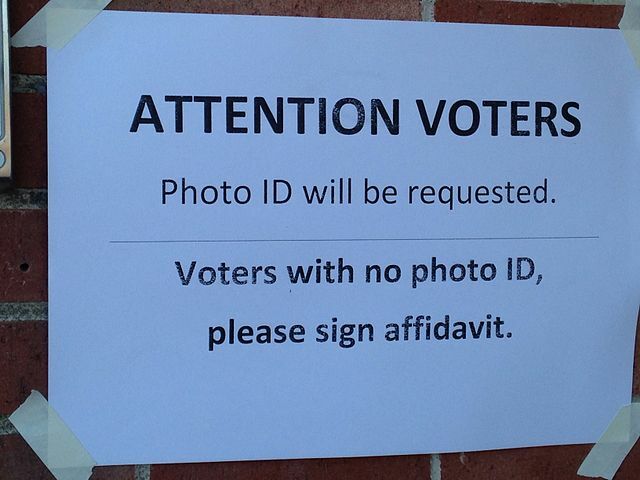 Voters will be required [state voting rules] to to present one of a limited number of government-issued photo ID documents. Texas officials assert the law is necessary to prevent fraud and to increase public confidence in the electoral process.